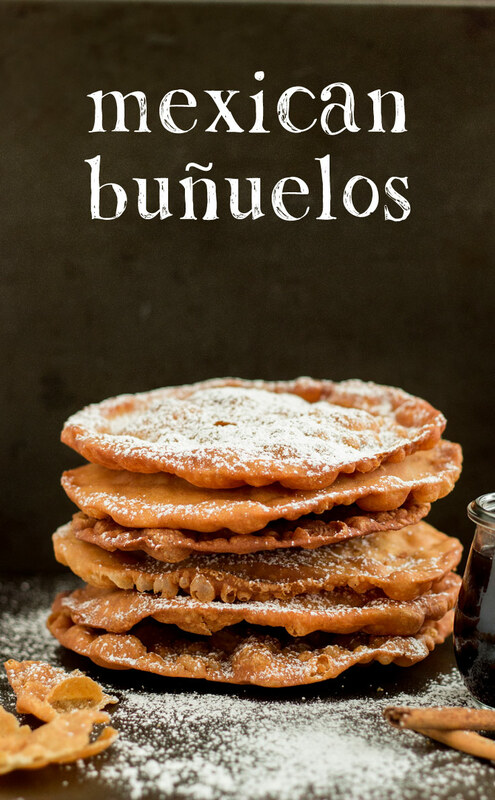 Also known as Mexican fritters, Mexican buñuelos are traditionally served with a syrup that’s flavored with anise seeds that are similar to fennel seeds and give the treat a subtle liquorice-like taste. 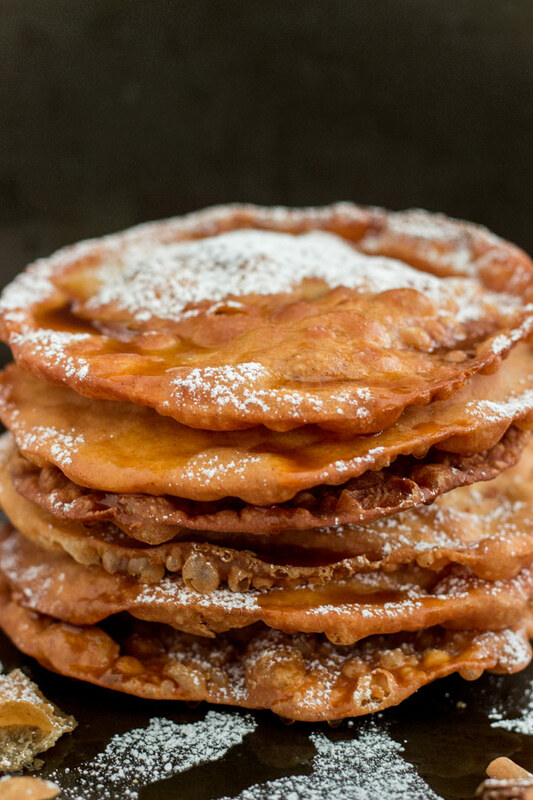 If you can’t find Mexican buñuelos at local festivals, you can recreate them in your own home. The simple dough mixture is hands-on: mix with your finger tips, knead, let rest, and then separate, roll flat, and fry. Although enjoyable with a simple sprinkle of powdered sugar or cinnamon while served warm, an added drizzle of honey or sweet syrup along with a mug of champurrado or chocolate atole (Mexican hot cocoa) will keep you warm throughout the holiday season. In a small saucepan, heat water, sugar, butter, vanilla, and cinnamon over medium heat until it simmers, then remove from heat and allow to cool completely. In a separate bowl, whisk the egg, and add it to the cooled liquid mixture. Gradually pour the liquid and egg mixture into the large bowl, combining the wet and dry ingredients using your fingers. Mix until it forms a soft, cohesive, clay-like dough, much like dough for tortillas. Knead for 3-4 minutes until the dough is elastic and smooth. Cover the dough with a cloth and let it rest at room temperature for 30 minutes. Uncover the dough, and on top of dry, clean kitchen towels, divide the dough into 10-12 pieces (you can divide them into more pieces for smaller buñuelos. Roll each into a small ball. Using a rolling pin on a dry, lightly floured surface, flatten each ball into a circle about 7-8 inches in diameter (or until it is almost transparent). Or, for a shortcut, you can get the process started with a tortilla press. For a thinner buñuelo, stretch the dough edges apart even further with your hands. You want to be able to barely see the outline of your fingers through the dough. In a frying pan large enough for each buñuelo to lay flat, heat one-inch of oil. Deep-fry the buñuelos one at a time. Using tongs, press down on the buñuelo to push down some of the bubbles and to rotate. When the first side is golden brown, 1-2 minutes, flip over and fry on the other side. Lay each buñuelo on a paper towel for a few minutes to drain excess oil. Serve immediately. 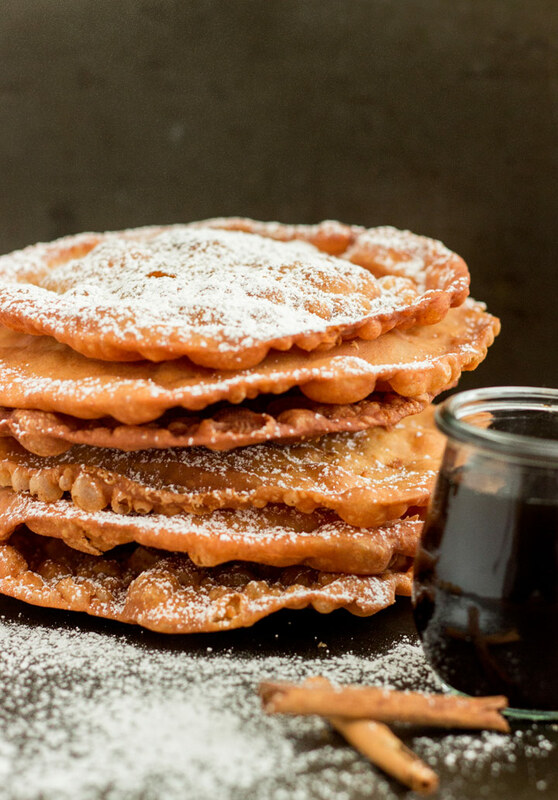 Dust with powdered sugar, stack for easing snacking, and offer them to friends with a pitcher of warm brown sugar syrup. *Anise seeds are available in the spice isle, often labeled as “aniseeds.” While they’re similar to fennel seeds, they come from a different plant that’s native to the Mediterranean region. In a saucepan over medium heat, bring 1 cup of water and the brown sugar to a boil, reduce to a simmer and cook for 2-3 minutes..
Gradually add the remaining 1 cup water, cinnamon stick, anise seeds, and orange peel. Return the mixture to a boil, reduce to a simmer and cook for 10 minutes until slightly thickened. The syrup should still be relatively liquid. Remove the syrup from the heat and strain to remove the solid ingredients. Set the syrup aside to cool for a few minutes. 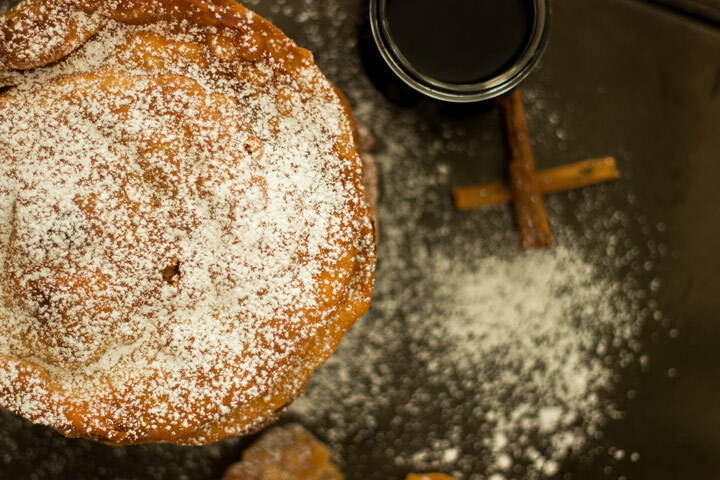 While still warm, drizzle it over top of a buñuelo for a caramelized, syrupy crunch. These look glorious – almost like a flat churro right? @RunninSriLankan:disqus That’s a great way to put it! @BakingAMomentAllie:disqus They’re so good and I’m right there with you!